There’s nothing like the sweet scent of cinnamon sugar donuts on a Saturday morning. 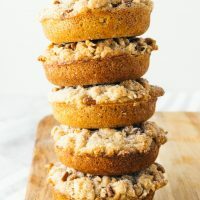 But what makes these cinnamon crumb cake keto donuts so special? The fact that they are totally gluten-free and low-carb! 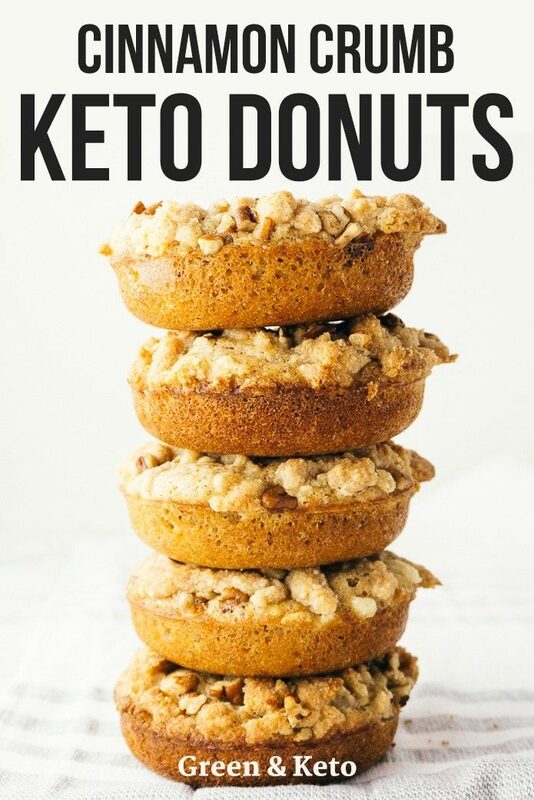 Keto Donuts…or is it Keto Doughnuts? 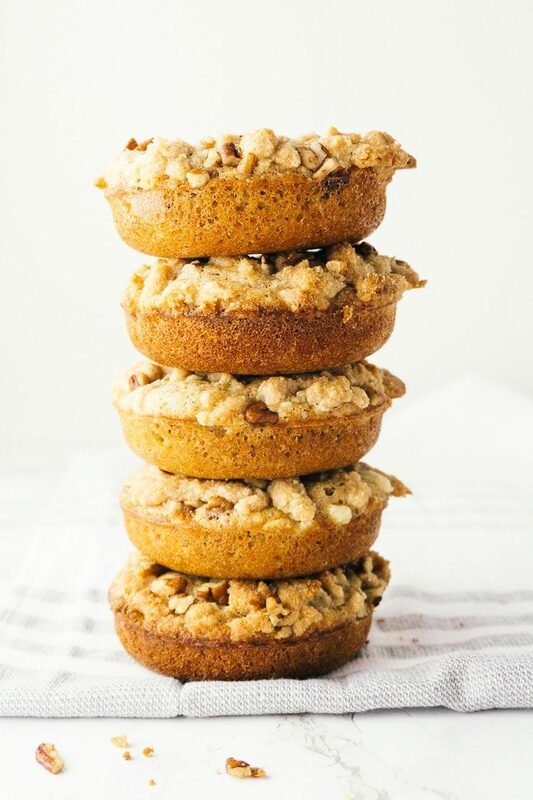 No matter how you spell it, these low-carb donuts are amazing! Just 1 carb per serving! And they’re so easy to make, because these keto donuts are baked, not fried. Horray for much less cleanup involved! This recipe makes about a dozen doughnuts, depending on the size of your donut pan. If you are looking for one, let me recommend this nonstick donut pan. 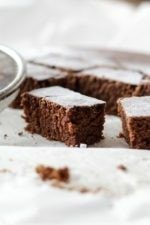 They are nonstick, which is a big bonus, especially when it comes to keto baking. Like most of my keto baking recipes, these donuts start out with good, old almond flour. 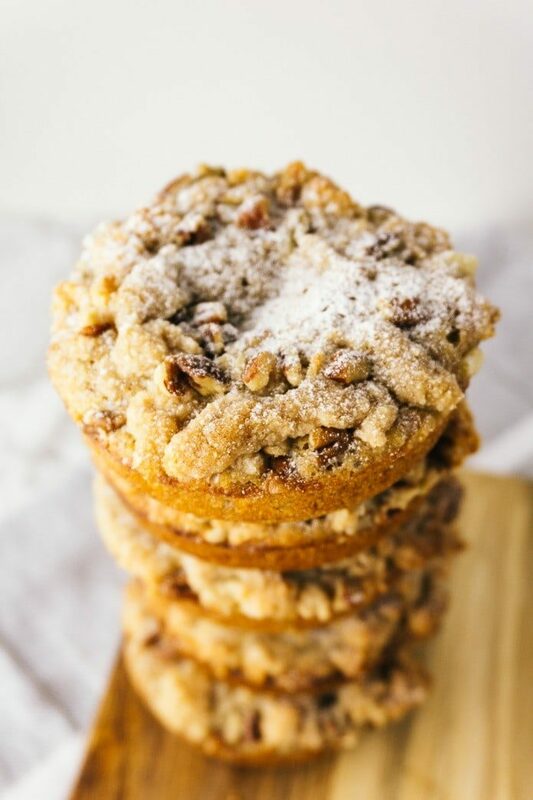 Almond flour is one of the best grain-free alternatives to all-purpose wheat flour. It’s practically a pantry staple for folks following a ketogenic diet. For baking, I like to use an almond flour made from blanched almonds with a super-fine ground texture. And, if you don’t use almond flour as frequently as I do, you can store it in your refrigerator or freezer to keep it fresher, longer. Coconut flour is a high fiber flour that is super useful in gluten free, grain free and low-carb baking. But because of its high-fiber content, baking with coconut flour can be a bit tricky. Coconut flour absorbs liquid like crazy — so recipes using coconut flour tend to have a higher ratio of wet ingredients like eggs, coconut milk, or water. Just like with almond flour, your coconut flour will stay fresher longer if you store it in the refrigerator or freezer. Gluten-free flours can often require thickeners or binders such as xanthan gum. But in this recipe, I skipped xanthan gum in favor of a tablespoon of flax meal. Flaxseed meal gives this keto donut recipe added nutrition and a delicious nutty flavor — and it also acts as a natural binder. To make the batter, mix all the dry ingredients together. Then, in a separate bowl, mix all the wet ingredients together. Pour the wet ingredients into the dry ingredients, and stir to combine. That’s it! 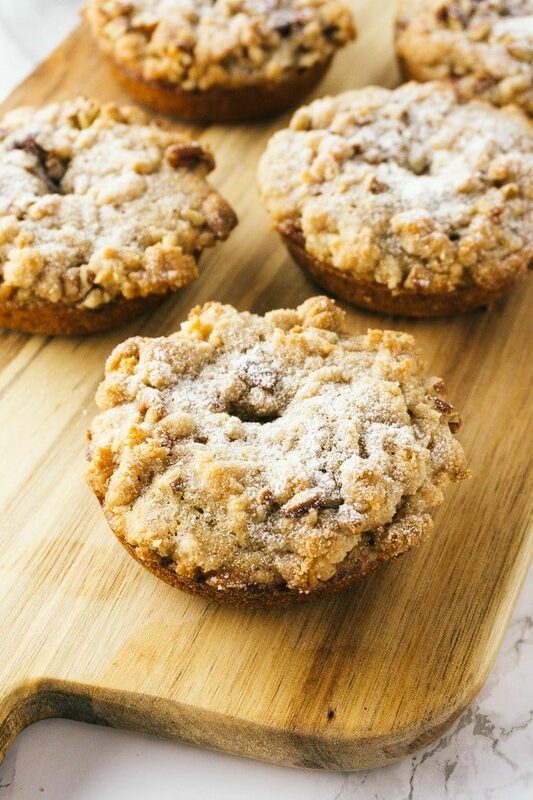 To make the crumb topping, mix some almond flour, sweetener, and salt with softened butter. Using your fingertips, sprinkle the crumb topping over the donuts. No need to pack it down! Here are a few tips to ensure that your keto donuts turn out soft, fluffly, and delicious. Make sure your ingredients are at room temperature before baking. To bring eggs to room temperature quickly, place them in a large bowl of very warm water for a few minutes. Use fresh baking powder. Baking powder makes these donuts rise — so you want to double check that your baking powder is active. To test if your baking powder is still active, place a teaspoon of baking powder in a bowl and pour 1/4 cup of boiling water over it. It should bubble up right away. If it does, it’s still good. Let the donuts cool in the pan. Gluten-free batters — and especially keto batters — are tender and crumbly when warm. So, it’s best to let the donuts cool in the pan before removing them. I find that the room temperature (or just slightly warm) donuts have better flavor, too. You can store these donuts wrapped tightly at room temperature for a couples days — but honestly, they’ve never lasted that long at my house! Mix up a batch of keto doughnuts this Saturday morning, and they’ll be done baking before you’ve finished drinking your bulletproof coffee. 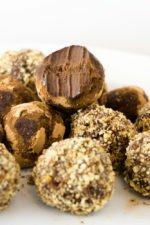 If you like baking keto desserts, you may also like my Chocolate Oreo Keto Cookies, Two Ingredient Keto Chocolate Truffles, or Fudgy Keto Brownies. 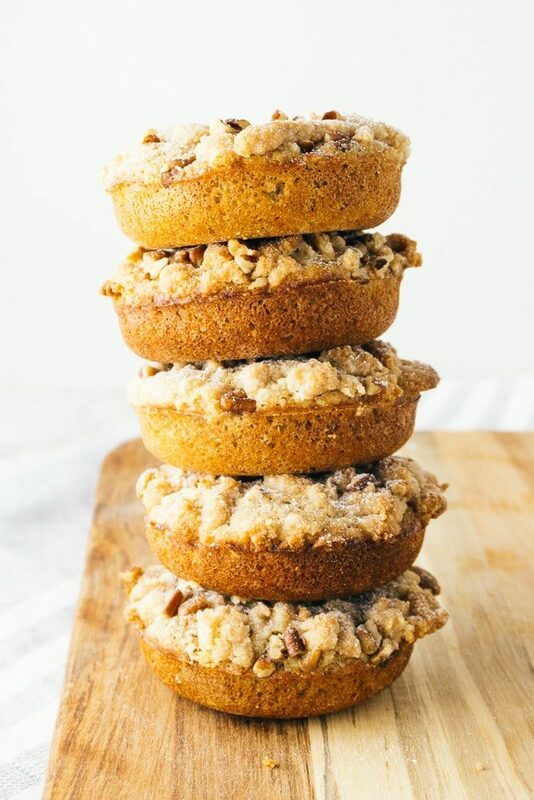 Delicious cinnamon sugar keto donuts with an almond crumb topping. Low carb donuts never tasted so good! Preheat oven to 350°F. Spray a donut pan with non-stick spray. In a medium bowl, whisk together the almond flour, coconut flour, flax meal, baking powder, sweetener, salt, cinnamon, and nutmeg. Set aside. In another bowl, whisk together the eggs, melted butter, and vanilla until smooth. Pour the wet ingredients into the dry ingredients and mix until just combined. Spoon the batter into the donut cavities, filling 3 ∕ 4 of the way full. In a small bowl, stir together the almond meal, sweetener, and salt. Mix in the butter. Stir until all of the flour is incorporated and the mixture is moistened throughout. Sprinkle the topping on each donut, using your fingers to break up the mixture until it is evenly distributed. Bake for 12-15 minutes or until the edges are lightly browned. Allow donuts to cool down until you can handle them. Donuts are best served the day you bake them. Leftovers keep well covered tightly at room temperature for up to 2 days. Make ahead tip: You can freeze the baked donuts for up to 2 months. 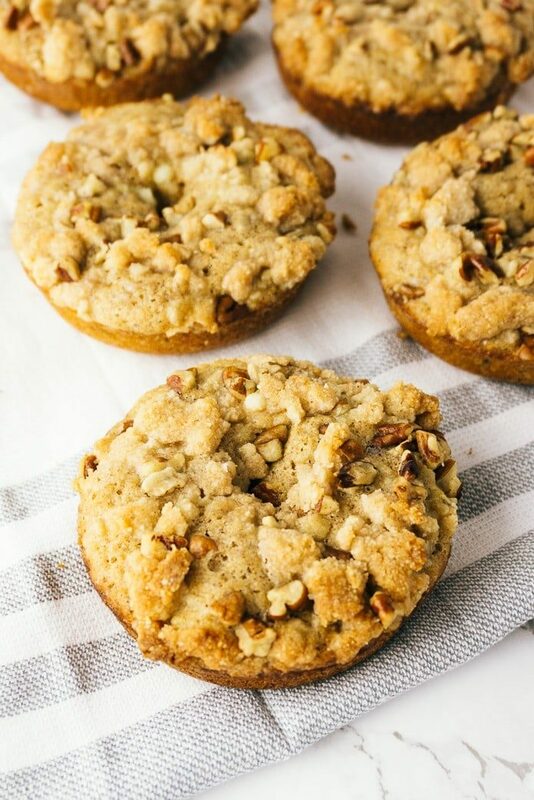 Muffin Variation: You can make this recipe into 8-10 muffins using a muffin pan. Bake at the same temperature for 18-20 minutes or until lightly browned. 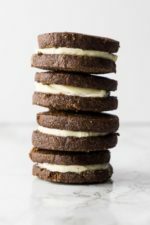 See additional tips for keto donuts in the post above! They are 1 carb per serving. Carbs can vary by brand of ingredients used, so if you want, you can plug your specific ingredients into a calculator. I like MyFitnessPal. Hi! Wanted to check if I can substitute the flax meal for psyllium husks since I can’t handle flaxseeds. That’s a really good idea! I haven’t tried it myself, so I can’t say for sure, but I think it would work well. I made these into cupcakes. They are great. Thanks for the recipe. LOVE DONUTS & YOUR RECIPES!. How much Xanthum would you use? 1/2 tsp. would be great! I noticed in the picture that it looks like nuts in the topping. There is no nuts in the recipe. Yes, you can add nuts if you like. 1/4 cup of chopped toasted pecans would be nice! I made 12 muffins, delicious! Added a bit more cinnamon to the batter and a bit to the topping wth walnuts instead of pecans. Moist and flavourful. I made these muffins because I didn’t have a donut pan. These were absolutely delicious. Thank you so much.